Today we’re are so happy to be able to share this conversation about locksport we had with TOOOL Orlando Chapter Lead, Willa Riggins. Willa comes from the InfoSec world with a background as a system, software, and security engineer. We are thrilled she is an addition to the lockpicking world and has shared some of her experiences and stories with us. 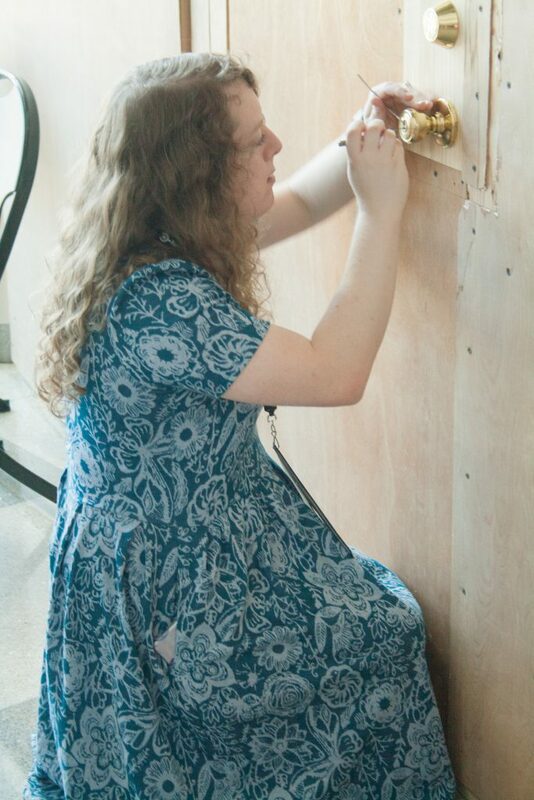 Christine: How did you first become interested in lockpicking? Was there a moment you found your interest in it had sparked? Willa: Somehow, despite being in the information security field for years, being a leader of a hackerspace, and being involved with Maker Faire and BSides events I managed to avoid all the lockpick villages. One year at Maker Faire Orlando my friend Jess Hires, who at the time was part of Jacksonville TOOOL*, was scheduled to run a series of lockpicking classes. He had everything loaded in, and then he got the call that his helper wouldn’t be able to make it. He asked if I could help run the classes, and I had to tell him that I didn’t know how to pick. He taught me that afternoon, and I was teaching classes later that day to 20-30 people every 3 hours over the course of the 2-day event. He gave me a set of picks as a thank you, and after that, I was hooked. *TOOOL is The Open Organization Of Lockpickers, a lockpicking club. Christine: What were your experiences picking a lock for the first time? Willa: The first time I opened a lock it felt like magic. I didn’t feel the pin order, the tension, or the setting of the pins that first time. It just sort of happened, and then I did it again. After the third class I’d taught, I could open a Master Lock #3 rather reliably while walking around and giving direction to students. I could pick, and I understood how the mechanism worked, but I still couldn’t feel the individual pins. Christine: How did you become involved with TOOOL and a chapter leader? Willa: After a few years, Jess wasn’t able to make the trek from Jacksonville down to Orlando to teach at Maker Faire Orlando. One of the organizers asked if we could start a lockpicking group here in Orlando, and I stepped up. After hunting down TOOOL board members at DEFCON, starting up unofficial meetings at our local hackerspace, and asking Jess to put a good word in for me we’d finally managed to get an official chapter started. I’ve been running the chapter ever since; we meet every month at our local city-sec event and teach at several community events throughout the year. Christine: Do you have any female members in your chapter? Do you think there is anything that could change in the world of lockpicking so that we see more women involved? Willa: Our chapter is rather small membership wise, but our regular monthly meeting attendance is mostly men. At events like BSides Orlando and Maker Faire Orlando, I see a lot more diversity, however. This year at BSides Orlando, I had at least 50% women in the Lockpick Village the entire weekend. Likewise, at Maker Faire Orlando I saw a lot more young girls, mothers, and grandmothers who learned to pick that weekend. Making lockpicking more accessible and less ‘scary’, lowering the barrier to entry, and diversifying the leadership goes a long way in bringing more women into the sport. Before you can educate new lockpicks you have to get them in the door. Christine: Of the women that you see come through the Lockpick Villages that you run, do you feel like they have heard or been exposed to lockpicking as a hobby or as part of professional development any more or less than the men? Willa: I’d say most of the women that come through the village are relatively new to locksport. Some are regulars who come back year over year to pick at the village, though. A lot of this is self-selection; the information security industry is a heavily male-dominated field but it is getting more diverse as time goes on. Giving women a safe space to learn locksport and other security disciplines helps with that, in my opinion. Christine: I really hope for this too! In my experience, women tend to be a little bit more hesitant to approach us, but once they realize we are friendly, what we do is really cool, and that they can do it too… They are super excited and that turly makes me happy! Christine: For someone who has never heard of locksport before, what would you say about it? Willa: For me, the lockpicking community shows that security doesn’t need to be unfriendly or daunting to interact with. Everyone at TOOOL, and everyone I’ve had the pleasure to teach lockpicking to has been excited to learn, grow, and to spread that excitement to others. Seeing that gives me hope that, in information security, perhaps we can see that same excitement and friendly knowledge sharing with those outside our industry, too. Willa: I really enjoy looking at different types and styles of locks, learning how they work, and their faults. Everyone knows about pin and tumbler locks; they use them every day. Picking tubular locks with tubular picks and demonstrating how to create a key from the pick’s pin heights is something completely different. Likewise, picking warded locks is interesting because you’re exploiting the design of the lock, not the machining inaccuracies. I’ll be taking a better look at disc detainer locks in the near future, and maybe safes after that. For me its more about breadth than depth because you never know what someone will throw at you next. Christine: I think as lockpickers, we have all have that rush of adrenaline when something you’ve been working on for a while finally opens. Can you recall any awesome moments of satisfaction you’ve had? *This is the perfect example of why we follow the Golden Rules of Lockpicking! It’s so easy to get caught off gaurd and not realize that you’re in way over your head before its too late. Christine: Can you tell us about any stories about when lockpicking saved the day? Willa: We had an incident at Maker Faire Orlando wherein a group of Storm Trooper cosplayers from the 501st locked themselves out of their changing room. The venue told the organizers they didn’t have a key, and the organizers didn’t have one either. A radio call later, and one of the organizers rode over to the Orlando TOOOL lockpick village on his motorized cooler* and asked if I could pick a lock for some Storm Troopers. So we head on over, and I’m standing in front of a rusty old commercial door with a jam guard while surrounded by the Maker Faire Orlando team and their Storm Trooper friends. No pressure, right? Thankfully I was able to use a city rake and then single pin pick the last two pins and open the door. *Willa and I had a funny exchange about this “motorized cooler.” After she wrote me about it, I replied asking her if she made a typo and meant to say “motorized scooter.” In true Maker Faire fashion, she hadn’t made a typo and really did mean “motorized cooler.” She even sent me photos of Maker Faire Orlando organizer, Ian Cole. Christine: Any messages you’d like to spread about lockpicking and locksport? Willa: One of my favourite moments at the lockpick village was when a young girl and her father approached the table at Maker Faire Orlando last year. She walked up with a full set of picks, and her father told me, “Oh, she does this all the time. We had to buy her a set of her own.” They’d been coming to the faire for a few years and kept coming back year over year to pick more locks. That, to me, is a major win for locksport and especially for women in locksport. That same day I had two very kind grandmothers approach us as we were about to pack up at the end of the event. They asked what we were teaching, and I explained that we were picking locks. They gave me a quizzical look and sat down. That evening they both picked their first locks and watching their faces was everything I needed to keep me running the village next year. Thanks so much for enjoying this installment in our “Women in Locksport” interview series. Please check back with us for the next interview and if you are or know of any other women the awesome realm of locksport, please contact us, as we’d like to continue to include as many fabulous people in our series. You can check out our other interviews in this series that include Christina Palmer and Grace Nolan here.